Bernard: Thank you, my darling. Mathilde: Am I hearing right? Bernard: Yes, you are still my darling, even if you don't care. My darling. François Truffaut, the much revered and most popular of the early French new wave directors, has fallen out of favor with many cinemaphiles in recent years. He has been criticized for relying too much on romanticism, for trying too hard to make films that every audience could enjoy. Many film elitists, it seems, are happier with the more distant, less accessible works of Godard, Rivette, and Rohmer. My own personal reaction to the director is more positive. Yes, perhaps his later films do slip into melodrama or to concentrate on the re-invention of the form of filmmaking rather than the true emotional center so prized by new wave filmmakers. But even his later, less respected works are well crafted, accessible yes, but also full of rich characters and unique, unconventional, and sometimes startling shifts in tone. 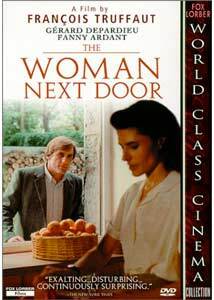 The Woman Next Door, completed the year after The Last Metro won Truffaut 10 Cesar awards, tells the story of two lovers seemingly entwined by fate. Bernard (Depardieu) and Mathilde (Ardant) shared a tumultuous affair years ago; now, both are married, he to a child, and she to an older man. When Mathilde and her husband move next door to Bernard, however, old passions reawaken and the two quickly find themselves in the middle of a relationship they'd hoped forgotten. They grow unstable as Truffaut focuses on the inner turmoil and secret desires of the former lovers. It's a potent story of l'amour fou (mad love), as lust and passion bring them together while threatening to rip their worlds apart. Truffaut's take on such potentially over-the-top material is to treat it with the distant eye of an unimpassioned observer. Some have accused the film of slipping into melodrama. True, it does contain elements of said, especially the rather haunting conclusion. But it's presented obliquely, we are not allowed to get inside the heads of these characters, we merely observe them from afar. The camera rarely moves past a medium two-shot, and the character's entire bodies are almost always visible, particularly in scenes with Bernard's wife and child. Truffaut, so enamored of children in the past, treats Bernard's son as a non-entity, and it seems the workings of family life play little part in the attraction of two trapped in l'amour fou. Truffaut seems to concentrate on the distance between even such passionate lovers, be it the barren alley between their houses or their placement in the frame. Gérard Depardieu and Fanny Ardant give appropriately distant performances as well. Their emotions feel real rather than created. Ardant especially is almost haunting in her ability to use nuance, small movements, and subtle expression to create a character of such realism that defies any overdone elements of the story. In the end, The Woman Next Door is less a film about two people than a study of the form of storytelling. The audience's distance from the material defines its interpretation. It can't be melodrama becomes it isn't garish enough to shock or titillate. It's simply a reserved story of fate with a twist of irony that could've easily been called, as the trailer states, "not with you, not without you." The phrase works on a narrative level, but also on an audience level: the film is never reaching out to "get us," but we, as observers, play an integral role in creating the story. Image Transfer Review: This 1.66:1 transfer is, sadly, not anamorphically enhanced, but it suffers from many other problems as well. Film grain is very apparent, with darker scenes especially looking very grainy. Black level is poor, and night scenes tend to look a bit digital. Colors are muted (as was most likely the intent), but they still appear overly dingy, like the print was dusty or something. Overall, the image is rather soft, so luckily edge-enhancement isn't a problem. Nor is aliasing or artifacting, except in one shot. Scratches and marks on the source material are never a major problem either. Audio Transfer Review: Sound is unimpressive but acceptable. Dialogue sounds rather weak, with evident background hiss, but is clear nevertheless. The music fills out the sound in the front mains a bit, but the front soundstage is, overall, very constricted. Still, Truffaut isn't known for his innovative sound design, and this track fits the film well enough. Extras Review: Extras are limited to filmographies (highlighting award-winning work), the theatrical trailer, and an impressive trailer gallery featuring nine of Truffaut's films. Included are The 400 Blows, Jules and Jim, Two English Girls, The Last Metro, Confidentially Yours, Stolen Kisses, Soft Skin, Bed and Board, and Love on the Run. Subtitles are in English, non-removable, and chaptering is woefully inadequate (only eight for the nearly two hour film). The Woman Next Door is a typically strong outing for Truffaut. A measured, distant, and ultimately ironic character study that concentrates on the interior and relies on the discomforted and disconnected audience member. It's a moving, portrait of love, fate, and jealousy, and well worth a foreign film fan's time.